Remember the Meeting for December is NOT at our usual location. Please see the Facebook page for more information on the official SAMQG Holiday Party at Rosario's downtown. Had a fantastic day sharing my love of paper piecing with some other quilters. I introduced them to two projects. Each sewist finished one block from the one project and got started on the other. I was able to explain the whole process but wish I could have demonstrated more about putting the whole thing together. But I gave them some handouts with step-by-step instructions and hope that we will get to see the end results soon. Everyone was hard at work. We also took a look at different paper piece quilt block designers and explained what the different styles/techniques were. Shared lots of books and patterns with examples as well as some different paper pieced quilts I’ve done. Everyone stayed busy working on their projects and seemed to like the end results. Not sure they’ve turned into a paper piecer lover like I am but at least they don’t hate it and won’t be scared of paper piecing from now on. I had never been to Honey Hill before but it sure was the perfect location for this workshop and I would love to spend a whole weekend there sewing. Hopefully I’ll get a chance to go back in the near future so I can finish at least some of what I've already started. Everyone had enough space for everything they needed. Just wish we had more time to spend sewing. Here’s some pics of the finished hexi-drive blocks. It was a fun and productive weekend. And I enjoyed getting to know everyone a little bit better. Just wish we had more time. I just had the best time ever and couldn’t wait to tell you all about it. First off, let me just say the thought of sewing without a plan makes me nauseous. Using busy prints all together in one place gives me hives. But I just spent the day doing both and not only am I not sick, I feel great. I really want to keep sewing but I needed to take just a little break to share the excitement with you. Today I went to the perfect workshop. Jessica helped us plan the party. She made sure we had the right hostess and then showed us how to figure out who to invite. Not too many and not too few. One of us had an eclectic group. Another only invited relatives. And some had both family and friends there. We made sure our hostess had some supporting cast. We provided entertainment and snacks for our parties. We even invited some girls in ugly dresses to make our hostess look even better. We made sure we invited some who weren’t the life of the party but still liked to have fun. Our aim was to make our hostess stand out, but still let her friends show themselves, and be happy about where they were and how they looked. Color parties are quite an adventure. And those of us who participated couldn’t wait to go home and use our design walls to watch our party continue to happen. I admit, for a while my shoulders were tight, my knuckles were a little bit white, and I did feel a little queasy. But Jessica was so encouraging, the others so enthusiastic, and the whole process so forgiving that it became fun for me. I didn’t need to cut accurately or even sew a perfect scant quarter inch. It didn’t provide the immediate gratification I get from paper piecing, but it did get me excited. And that excitement is staying with me. And that means this quilt won’t become another project shoved in a drawer because it was too hard, taking too long, or no longer interested me. This party will happen. And it will be awesome. As you may know, we are having a rockin' awesome Pillow Swap at our Holiday Party this December. Have you tried out a new technique? Will it be quilted, embellished or home dec fabric? Have you browsed the Pillow Talk Swap* groups over on flickr for inspiration? There's loads to consider for your modern pillow design. One thing we'd like to help you out with is the "finishing" of your pillow. Of course you can sew your pillow closed after you place the fluffly pillow insert into the design, but there are other options, too. 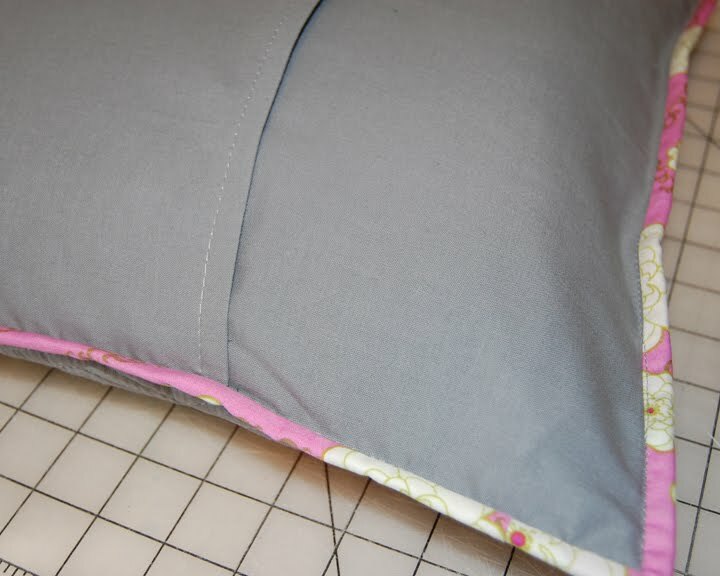 One of our members, Erin S, has a great blog tutorial for applying an invisible zipper in your pillow design. Check out one of the best invisible zipper tutorials on the web, HERE. This zipper can be applied to any shape pillow. If zippers aren't your thing, you can try an envelope closure, where two pieces of fabric overlap on the back side of a traditional rectangle shaped pillow. Check out the envelope closure technique, HERE, from ReannaLily Designs. There are still many other ways to finish your pillow: button closures, ties, decorative closures, center applied zippers, etc. We cannot wait to see what you make! *Our swap is NOT part of the flickr group swap. That link is provided for inspiration. If you dared travel up to Borne through the Interstate 10 closures on Saturday, October 18th, then you were treated to an intimate class of dedicated and determined bag makers. Joanna Marsh, pattern designer and teacher, treated her students to Bear Moon Bakery pastries and to a class full of new techniques including two different zipper installations. Her pattern is for The Body Bag Duffle (#bodybagduffle), a bag big enough to fit a body. 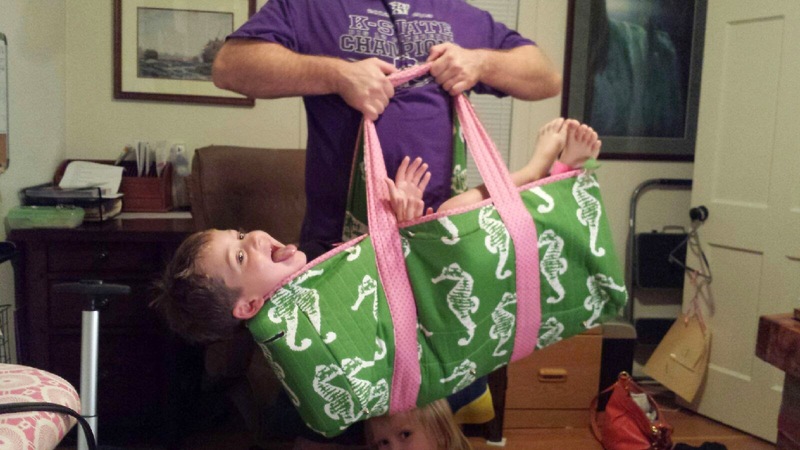 A fact participant Regan Peters verified when her 50lb son put her seahorse bag to the test. Because it was an intimate class, participants were able to work at a pace that was comfortable for them as Joanna wandered around offering one-on-one help. Though the participants would like to claim that this was truly an advanced bag making class, the fact remains that beginners and experts alike left the class with new ideas, skills, and a fabulous bag that can easily haul whatever you just can’t bear to be without. Oh my gosh, how great is our SAMQG Bunting banner? I love it. I love that it is the longest banner I've ever seen... ever. The banner was made as a BOM, a short while back. Kits were provided and each member made one or two of the triangles. The banner was then finished off with the pink ribbon/bias. October 2014 SAMQG meeting was "Demo Days" in a round robin style where there were 4 stations set up and 4 guild members each demo'd a technique or style or method used in their quilt-making. 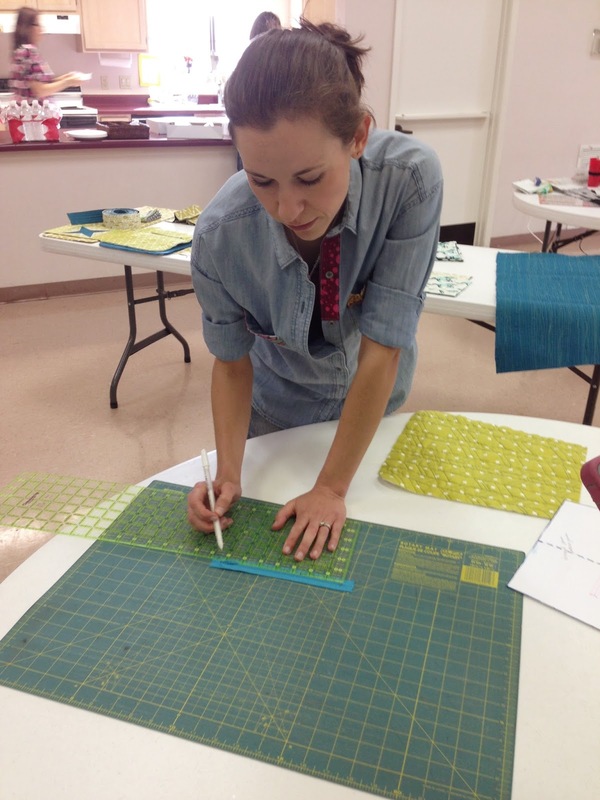 Jordan shared her methods and tricks for basic improv piecing. Hi Jordan! This is Jordan, holding an improv quilt she made. She pointed out that the blocks go together fast and mostly from assorted scraps. You are just one 40% off coupon away from loads of negative space in your quilt design. In this picture, above, she's showing us that her stash is sorted into sizes. Big scraps, Medium scraps and smalls. Very smart system because in improv piecing you'll need to be able to match a random size side length or at least be able to build a piece long enough. Personally, I have to say one of the most interesting fundamental parts is how she sorts all those scraps. This block is an improv pieced block. It is not wonky. It just is improvisational in that it didn't have a starting plan other than to sew scraps together. Every scrap in the orange piece was used in a previous quilt, which is why this block is very tidy and organized or, as it has been said "The Stepford Wife block of Improv Piecing"
The two photos above are a bit more improvised and unstructured. Below: Jordan also did a quick demo of improvised curve piecing. Now that was all-kinds-of cool. Take two pieces of fabric. Lay them on top of each other, with BOTH right sides of fabric facing up towards you. Fold one fabric onto the other fabric and start joining the curve. The two pieces will appear to not match, as one is a convex curve and the other is concave. You know, they really do match, though, because you just cut this curve shape through both layers. Take your time and work the fabric to stitch around the curve. I'm sure basic curved piecing strategies are already showcased on Youtube. And here's the finished gentle curve. This piece is ready to hit the ironing board and be worked into a larger design. Thanks for the improv tutorial, Jordan! Glue Basting for everyone! Thanks so much to Christine, who showed us how to glue baste our seams for more speed and accuracy. This is the super-expensive, hard-to-find, elusive, magical quilting tool needed for the Glue Basting technique. (*sarcasm implied*) Glue. White Elmer's School Glue. Christine does recommend using a fine-tip from Sharon Schamber's shop online. Let me appolgize in advance for not having the best pictures from this Demo station. She really did a great job and I didn't document it as well. SORRY!! Ok, so in this picture (or more accurately NOT in this picture) Christine had added a small bead of glue within the seam allowance of one square. Once the glue is applied, you add the second piece of fabric, right sides together, just as if you were getting ready to add in pins. Instead of pins, however, you line up your edges and hit that glue with a hot iron. Because fabric can shift a tiny bit when pinned, glue keeps the pieces ridiculously accurate. This is a perfect no-shift option to exact intersections on your quilting designs. Use the WHITE glue, not the gel glue. The gel doesn't set at strong. With the Glue Basting method, you can actually glue and entire row of blocks at a single time, without having to get up and down to go to the sewing machine. Just park that ironing board right by the design wall. Turns out, you can also glue baste those English Paper Pieced hexagons, too! Use a glue stick and remember the elementary school adage "A Dot is A Lot" when adding glue to the back of your prepared pieces. Once all the glue is applied and the fabrics are folded over, simply whip stitch your project together and remove the paper. Up next, Marilyn K. Marilyn makes the most amazing small-piece quilted works of art by adding beads and embellishments. Check out some of the close up details of her work. At her Demo Day station, she fielded loads of questions and answers regarding her thread type, her found materials her preferred beads and her assortment of perfect needles. Please please click on the photos to enlarge them. That is Marilyn, right there in the white. You've got to click on these photos to enlarge them. Every thing from found fabrics, to special metallic "tube net" stuff, to scraps to layers and layers of beads. Some of the stitches are quilting, some are applique, some are decorative, some are planned, some are wild and all are AMAZING. This is the wool + walnut shell pin cushion that makes it all possible. How cool is that net? This is a full-on treasure box of great sewing, beading, quilty, needlework goodies. Thanks so much, Marilyn, for sharing your awesome process with us. That artful bead work is very inspiring! 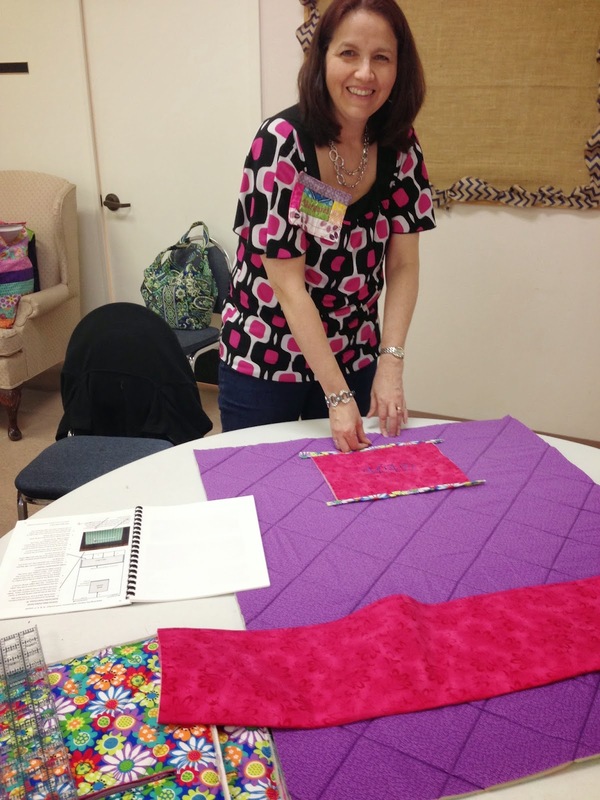 First up, Sara E. Sara was showing us how she prepped and "moderned up" T-Shirt Quilts. CAUTION: When cutting out the "motif" from the front of your shirt, do it with scissors and be mindful of the shirt back. In lots of cases, the shirt back has a bigger logo on it or at the very least, you'll want to use that fabric to fill in gaps in your final quilt design. Ok, now get down to making a regular shape with straight sides. It doesn't matter what the shape is. Grab a piece of fusible pellon interfacing larger than the t-shirt design. Place the shiny/fusible side up facing the WRONG side of the t-shirt. Sandwich the shirt + interfacing in between two layers of parchment paper. When you press the shirt to the interfacing, the extra glue will NOT get on the iron or board. And the parchment paper makes it super easy to peal off. This was a GREAT tip. Thanks, Sara!! The shirt itself is prepped and ready to rumble. All you do now is take it to the cutting mat to decide on your final straight-edged shape, while cutting away any excess interfacing. From there, Sara picks a fabric from her stash to start adding the sides of the t-shirt motif in a way that would do a "wonky log cabin" block. Pick a piece, stitch a seam, press, pick another piece, stitch a seam, press, repeat. Thanks so much, Sara! Those were some great tips. And the wonky or improved version of building up t-Shirt quilt blocks is wonderful. This is the Show'n'Tell quilt that Jordan H brought to our October Guild Meeting. I know you will want to see all the sections up close, so I grabbed loads of pictures for you. She tells us that many of her friends and family members are military and she often makes the military service members quilts. Usually she makes them and gives them away so quickly that she doesn't get to share them with the guild. Please click on the pictures to see them larger. This no-pattern, improv-but-not-wonky, quilt has loads of very interesting pieces. Hi Jordan, peeking from behind the awesome quilt. In the photo above, you can see the lettering "A R M Y"
In the photo above, the letters " H O O A H"
In the photo above, the word "AIRBORNE"
Interested in sponsoring? Email us! The blog content expressed is the point of view of the individual author, who is also a member of the SAMQG at the time of posting. The opinions stated do not represent the guild membership as a whole.